This 20th article in the series of “Do It Yourself: Electronics”, explains the basic working of IC 555 and generating a square wave using it. Playing with raw electronics (without any microcontroller), further boosted the confidence of Pugs to dive into non-microcontroller electronics. This time he decided to explore the ever popular IC 555, loosely also known as the timer IC. 555 is basically an 8-pin IC, with pin 1 for GND, pin 8 for Vcc, and pin 3 for Vo – the output voltage, which goes either high (Vcc) or low (GND), based on the other pins. Vo goes high if the trigger pin 2 senses voltage less than 1/3 of Vcc. Vo goes low if the threshold pin 6 senses voltage greater than 2/3 of Vcc. Pin 5 can be used as a control voltage always fixed to 2/3 of Vcc. Putting reset pin 4 low any time makes Vo go immediately low. So, if not in use it is recommended to be tied to Vcc. Discharge pin 7 becomes GND when pin 6 senses voltage greater than 2/3 of Vcc and becomes tristate (open) when pin 2 senses voltage less than 1/3 of Vcc. In other words, discharge pin 7 becomes GND when Vo goes low and becomes open when Vo goes high. Given this background, one of the common uses of the 555 IC is to generate a square wave of any particular frequency and duty cycle (on pin 3), by varying some analog voltage between GND and Vcc (on pins 2 and 6), more precisely between 1/3 Vcc and 2/3 Vcc, both inclusive. And this analog voltage is typically achieved by charging / discharging a capacitor through one or more resistors. Thus, the time constants given by τ = RC, R being the resistance, and C being the capacitance in the corresponding charging & discharging paths, controlling the corresponding on & off cycle of the square wave. Let’s consider the following circuit with R1 as a variable resistance (pot) between 0-10KΩ, and R2 as fixed resistance of 4.7KΩ, and C as a 1μF capacitor. In the on cycle (when Vo (pin 3) is high), pin 7 would be open. Pins 2 & 6 can be assumed tristate. Hence, then C is getting charged towards Vcc through R = R1 + R2. In the off cycle (when Vo (pin 3) is low), pin 7 would be GND. Pins 2 & 6 can be assumed tristate. Hence, then C is getting discharged towards GND (pin 7) through R = R2. Moreover, note that in the on cycle as soon as capacitor voltage reaches 2/3 Vcc, Vo (pin 3) becomes low, and pin 7 becomes GND, i.e. off cycle starts. And, in the off cycle as soon as capacitor voltage drops to 1/3 Vcc, Vo (pin 3) becomes high, and pin 7 becomes tristate, i.e. on cycle starts. And the above sequence keeps on repeating, thus giving a square wave on Vo (pin 3), with on time t_on controlled by charging through R1 + R2 and off time t_off controlled by discharging through R2. where Vs is supply voltage (Vcc in our case), Vi is the initial voltage on the capacitor. where Vi is the initial voltage on the capacitor. WARNING: Do NOT put the pot to a value of zero, as that will short Vcc & GND, and may blow off the circuit. A safety workaround could be to put a fixed 1K resistor in series with the pot. 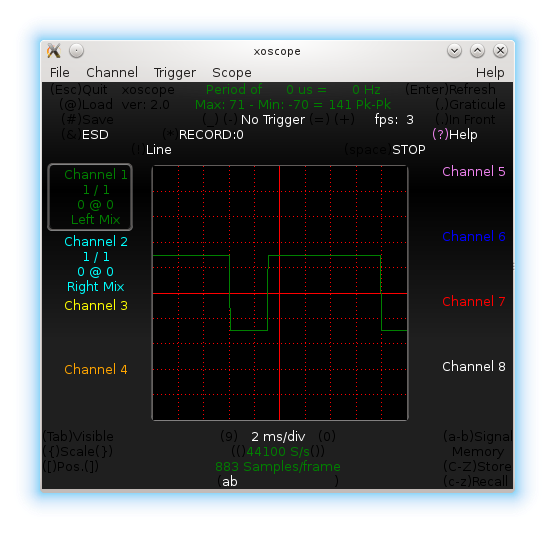 The audio jack is being used for observing the waveforms on the home-made PC oscilloscope, as created in his previous PC Oscilloscope article. Pretty close, but the t_off not really satisfactory. That triggered Pugs to take out his multimeter and check the resistance of the fixed resistor R2, he used. Ow! that actually measured 4.3K. Recomputing using R2 = 4.3K, gave values amazingly close to the observed values. Thus by appropriately choosing the R1, R2, and C values one should be able to get a square wave of a desired frequency given by 1 / (t_on + t_off) and duty cycle given by t_on / (t_on + t_off). Obviously, the frequency would have a practical upper limit dictated by the 555 IC, though it is typically in MHz. What about duty cycle? Note that as per relations (1) & (2), t_on will be always greater than t_off. Thus, duty cycle would be always greater than 0.5. So, what if we need duty cycle less than 0.5, or at least equal to 0.5, where t_on = t_off. This is what Pugs is working out on. Watch out for the next article. This entry was posted in Electronics and tagged 555 circuit, 555 timer IC circuit, basic electronics, basic electronics tutorial, fundamentals of 555, fundamentals of 555 timer IC, square wave using 555, square wave using 555 timer IC on September 1, 2016 by Anil Kumar Pugalia.